I don't want to spoil any of the book but this was fantastic. 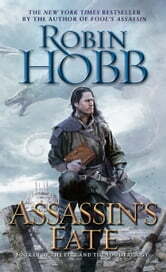 It was a great end to the Assassin's series of books and I had tears in my eyes by the end. Make sure you read the other series first but this was a great ending to the series and I enjoyed all of it. I just read 16 books in the realm that Fitz and the fool live. I couldn't get enough of them. I had half my body submerged in that world for the last 2 months. Not too many words to express how I loved each and every one of these books and all their characters. Awesome character development, great adventure, super engaging. I couldn't put the books down!! I loved it! Very convincing characters and vivid imagery. Made me cry in the end. I have never been so sorry for a story to end. Fitz & the Fool have made me laugh, & have made me absolutely wretched. I loved every moment. What a wonderful ending to their tale!